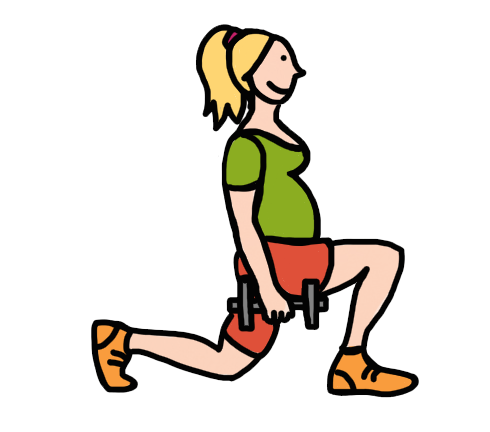 Exercise in pregnancy offers incredible health benefits, just as it does for those who are not pregnant. The effects of exercising in pregnancy may be even more pronounced, as the body is going through so many adaptations that having the support of movement and activity just can’t be beat. – Less medical intervention during labour and delivery, and a speedier recovery. – Potentially higher APGAR scores at birth. All of the above is really just scratching the surface! As many benefits as there are to exercise, there are still some common misconceptions that are swirling about the internet, which make women nervous about exercise, and particularly strength training and weight lifting in pregnancy. I want to clear those up for you, so you are confident in the gym and are better equipped for your prenatal strength training workouts. Truth: Core training is an extremely important part of preparing your body to have an uncomplicated labor, delivery, and better recovery. Not only that, but smart core training can help support your pelvis and spine during pregnancy which can save you months (and possibly years) of aching hips and back. Another big benefit of core training, that isn’t often discussed, is getting your baby into optimal alignment for labor and delivery. The position that your baby grows in and ultimately moves through the birth canal in, can make a huge difference in the outcome, time length, and medical interventions needed during your birth experience. Let’s do a quick recap of what the “core” is. The important pieces that you’ll want to get familiar with are your diaphragm (breathing muscle), the transverse abdominis (your deepest layer of abdominals), the multifudus (muscles supporting your spine), and your pelvic floor muscles (at the base of your pelvis and support your pelvic organs). We need all of these four parts to work together as a unit to give us a strong and stable core. – Keep your body in neutral spine: neutral spine is essentially good alignment. You’ll have a nice gentle arch through your lower back, your bum isn’t tucked under, and you’re thinking about growing tall through the crown of your head. This is something you need to watch closely during pregnancy to make sure you can breathe well, support the body as you gain more weight on the front side, and reduce the severity of diastasis recti abdominis (DRA), which I’ll go over in more detail below. Truth: Maybe. This is well intended advice, however I recommend not having too strong of attachments to your routine and specific exercises as you move further along in pregnancy. I am all for challenging the body and moving often, but we need to be cognizant of risk vs. reward. An example of this, is running. I fully understand that you may love running, have been running for years, and want to continue running throughout your pregnancy for as long as possible. However, we need to be cautious with the health of the pelvic floor. Consider the extra pressure from your baby, the placenta, fluids, and any fat that you may have gained during pregnancy. All this pressure on the core and the pelvis can be a tricky thing for your body to support, and specifically your pelvic floor and organs to withstand during thousands of foot strikes. If you are having any discomfort at all, any incontinence (leaking of urine, or feces), feelings of overactive bladder, low back or pelvic pain I would not continue running. You may even decide as a safety precaution, to switch to walking or incline/hill interval walking to get that cardiovascular “burn” you’re looking for. In the instance of running, or lifting very heavy weights, I am not concerned with babe’s health, but really more concerned with your body’s ability to have a well-functioning core and floor today and 20+ years down the road. Truth: If you have an instructor well trained in diastasis, the pelvic floor, and other common pregnancy symptoms, these can be great options for you. However, a lot of pilates and yoga type exercises can be risky for your diastasis and possibly increase the severity of an abdominal separation. Diastasis recti abdominis is the separation of your rectus abdominis muscle bellies, your “6-pack” muscle. This muscle group can begin to separate to the sides as your babe grows. It’s really a natural occurrence of pregnancy, however we want to make sure the separation doesn’t get too big, as that can really weaken the connective tissue (your linea alba) keeping those muscle bellies close. For more information on diastasis, be sure to read this article. (Anna – Link to thePTDC DR article: http://www.theptdc.com/2013/10/the-personal-trainers-guide-to-diastasis-recti/). If the connective tissue gets really stretched, it may lose the ability to gain tension, which reduces the stability of the core. It can also lead to the belly looking poochy or having that “mummy tummy” appearance for years postpartum. It absolutely can heal just fine post-birth, but it’s just best to give our bodies a higher chance of success. To reduce the severity of diastasis, and give it a better chance of healing postnatally, we want to avoid activities that put a lot of pressure on the abdominal wall as we get further along in pregnancy (typically between 18-20 weeks during first pregnancies, and possibly much earlier in multiple pregnancies). These exercises can include 100s, double leg raises, crunches, sit-ups, front planks, pushups, heavy conventional deadlifts, a lot of rotational work. – If you feel OK flat on your back, you should be ok to exercise in that position (I like to keep it about 1 min or less, and then switch positions). – Use exercises that keep you in neutral spine: Squats, lunges, overhead presses, rows, side planks, etc. – Do things that make you feel amazing, strong, and stable. – Walk daily to supplement your strength training. Balance your more intense exercise with more relaxing movement. Listen in to your body as you move through pregnancy. Don’t force yourself to do anything that doesn’t feel quite right, just because you were doing it pre-pregnancy. Your program will go on a journey and that is absolutely perfect!